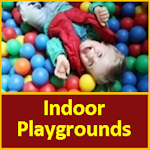 This is an excerpt from The Playground Guide- Sussex/Warren Edition: Over 40 of Sussex County parks are featured with color pictures in this guide + helpful information on every park in the county. These include parks in the south section of Sussex- Sussex YMCA, C.O. Johnson Park in Byram, Evergreen Park in Green and the Helen Morgan School in Sparta. This book also contains all playgrounds in Warren County. DIRECTIONS: Take Rte 616 or Rte 206 to CR669/Limecrest Rd in Andover. Turn north onto Lake Iliff Road, follow signs to the police station. Park entrance is less than ¼ mile on the left hand side, across from the police station. 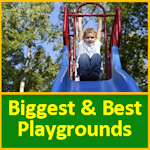 DESCRIPTION: Sprawling fields with a big, beautiful playground in the center. A number of play structures and freestanding pieces. Big hills surround the playground and two buildings with bathrooms are a short walk from the playground. MAKE A DAY OF IT: This park is a day in and of itself. Bring friends and lunch for a picnic or to grill. I just took my kids here today for the first time. What a wonderful playground! Spacious, not crowded, very clean and with a lot to do! My kids loved the sandbox and jungle gyms, but were so happy to see real see-saws (you don’t see them much anymore)! My little guy got his first taste of a bucket swing, too. If you’re in a wheelchair, this park has two wheelchair swings and the keys are kept across the street at the police station (can you find a safer place?). Awesome place and will definitely return! I would like booking info for the barn to have a NHS reunion. We do an annual NHS 80’s ball, and have been using the ABFD Hall. I would love to move it to the wonderful atmosphere of the barn. What is the capacity and cost? Proceeds to benefit NHS, so it is a charity event. No alcohol will be sold, as it is BYO, and beer and wine are provided in the ticket price. Why did they cut down those gorgeous shade trees in the picnic area? I used to go there when I was a child 20 yr ago. I am glad to see the “unique yellow climbing structure is still there. It is a beautiful huge park perfect for any occasion.